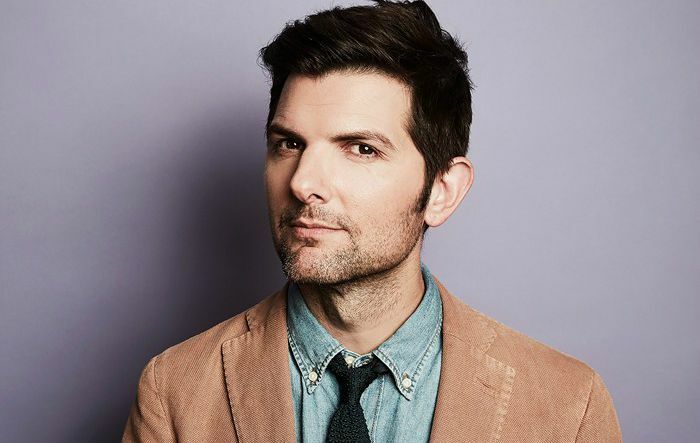 Adam Scott is an American actor and podcaster who came into limelight after playing Ben Wyatt in the NBC sitcom Parks and Recreation which earned him a Critics’ Choice Television Award nomination. He is also known for starring as Derek in the film Step Brothers, Henry Pollard in the Starz sitcom Party Down, and Ed Mackenzie in the HBO series Big Little Lies. Adam was cast in a number of films including Krampus, Knocked Up, Step Brothers, Our Idiot Brother, The Secret Life of Walter Mitty and Black Mass. Adam Scott was born on the 3rd of April 1973, in Santa Cruz, California, United States of America. He is currently 46 years old. Adam Scott is the youngest of the three children to Anne (born Quartararo) and Simon Dougald Scott, both of whom are retired teachers. He has two older siblings, Shannon and David. He is of one-quarter Sicilian descent, on his mother’s side. Adam completed his schooling from Harbor High School and graduated from the American Academy of Dramatic Arts in Pasadena, California. Adam Scott married Naomi Sablan in 2005. They have two children – a son named Graham Scott and a daughter named Frankie Scott. In 1994, Adam Scott made his film debut playing a minor role as Joe in the flick Cityscrapes: Los Angeles. His first credited role was with the 1996 film Hellraiser: Bloodline for his role as Jacques. In 1994, Adam appeared in an episode titled Pilot of the TV series, Dead at 21. Having played Caleb Sinclaire in the 2010 film The Vicious Kind, for which Scott was nominated for an Independent Spirit Award for best actor. His role as Ben Wyatt in the NBC’s acclaimed comedy series Parks and Recreation, He played state auditor in the series who arrives in the fictional town of Pawnee, Indiana to evaluate the town’s funds. Adam has an estimated net worth of $3 million as of 2018. Scott is the co-host and co-creator of the Earwolf podcast U Talkin’ U2 To Me? with Scott Aukerma. He has also guest appeared on numerous podcasts, including Comedy Bang! Bang!, How Did This Get Made?, and Kevin Pollak’s Chat Show. He is being starred as Max Jennifer, a book store employee and former Stanford professor, in the American supernatural sitcom, Ghosted, premiered on Fox on October 1, 2017. He’s also serves as executive producer in the series. Scott is a huge fan of the rock band U2. He is good friend with actor Paul Rudd.